Partial dentures may be tooth-supported or tooth and tissue-supported. Your Denturist can best explain the major differences between these types. Several factors determine the style or type of denture that is best for you. These include the number of remaining teeth, position and stability of teeth. 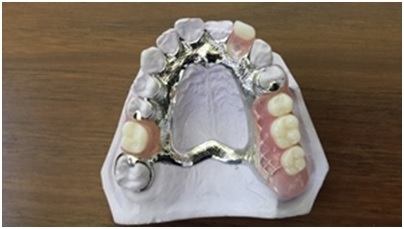 Partials can be made of acrylics, metal/acrylic combinations or flexible thermoplastics. 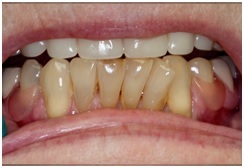 Acrylic partials are used primarily for transition or temporary replacement of missing teeth. 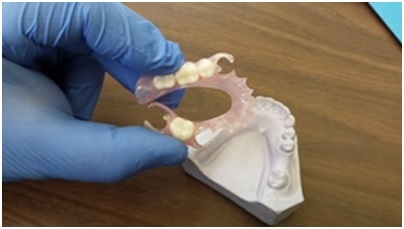 The metal/acrylic partial or "cast partial," is a more rigid and permanent style of denture. Metal is either a chrome cobalt alloy or titanium, both of which are very thin, light and strong. Major advantages of esthetics and flexibility are afforded by flexible thermoplastics. Partials must be removed nightly for the creation of a healthy oral environment. Thanks to newer designs, materials and techniques, partials are more comfortable than ever. 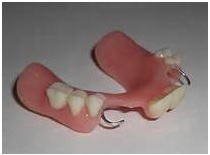 Ask your Denture Specialist about available designs, some of which have no visible clasps and are undetectable. With newer designs, materials and techniques, partials are more comfortable than ever before. Ask your Denture Specialist about the many designs available, some of which have no visible clasps and are virtually undetectable. Partials do not harm natural teeth and may prevent them from shifting or drifting into space left from loss of a natural tooth. Partial dentures may help maintain the position of natural teeth by adding support. A partial denture will enable you to look, feel and chew better! Millions of people experience problems as a result of missing teeth, many of which can undermine your self-confidence and quality of life. 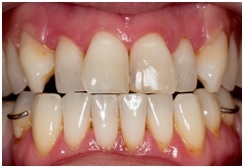 Missing teeth can impact your health, eating habits, speech and appearance. Bone loss usually follows tooth loss, affecting your denture. The denture can then become loose, resulting in loss of stability, difficulties with chewing and eventual jaw structure deterioration.